I had been meaning to post this for some time. I made up my stash of cloth pads. After my first attempt at making the 2 before I did a bit of research into patterns and techniques. On YouTube I came across Amy Nix. 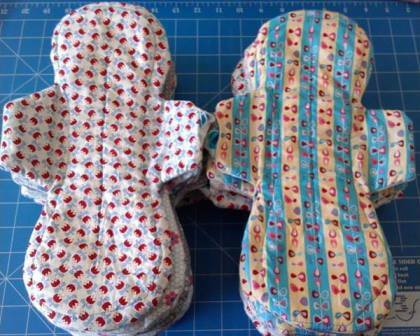 Amy is a wealth of knowledge in the area of reusable menstrual products. I watched all the clips she made and learnt a lot. When I first started to pull fabrics from my stash for the pads I got out all my ugly fabric, by that I mean fabric I’m unlikely to use in gifts. In my mind pads are functional not fashion so I didn’t need them to be pretty I just needed them to work. I ended up using the fabrics I pulled out on WIRES pouches. 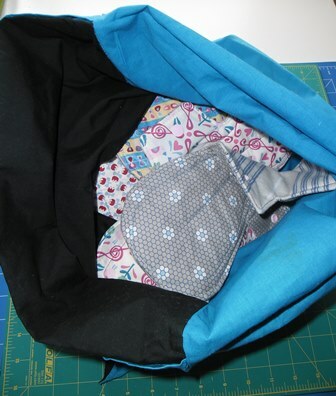 I had a fat quarter bundle of Rosalie Dekker fabric sitting in my stash so I used that. 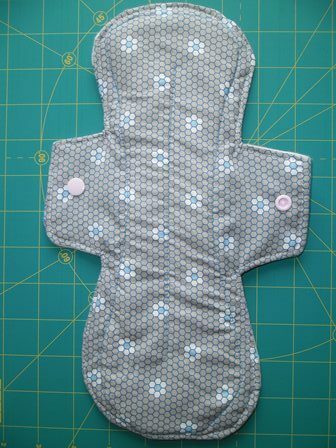 I never thought I would make pretty pads with fabric made in Japan. For the cores I used a combination of French Terry Bamboo and flannelette. I made 2 different absorbency levels heavy and regular. For the heavys I used 3 layers each of bamboo and flannelette, for the regulars 2 layers each. Each core had to be individually assembled so they layers wouldn’t shift about. This was a great project to use half full bobbins on as it didn’t matter what colour you used, I emptied a lot of bobbins. 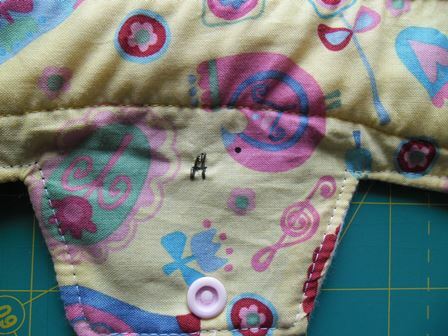 Once the core is done you attach it to your topper fabric (the pretty fabric) Your bobbin thread is visible on the top of the pad. I have half full bobbins in many colours and was able to match these to the fabrics. In addition to the line of stitching attaching the core to the topper I did a row of channel stitching down the centre of each pad. Chanel stitching isn’t fully necessary but some say it helps wick the fluid away and channel it into the pad. For extra peace of mind I decided to place a hidden waterproof layer in the pad of PUL (PolyUrethane Laminate) in each pad. It comes in many colours but you don’t actually see it as it is hidden inside the pad, I chose blue for obvious reasons. PUL is a breathable fabric which sounds strange as essentially it is coated polyester fabric but it was originally used in hospitals as it can be used closed to the skin, is waterproof and not harmful. 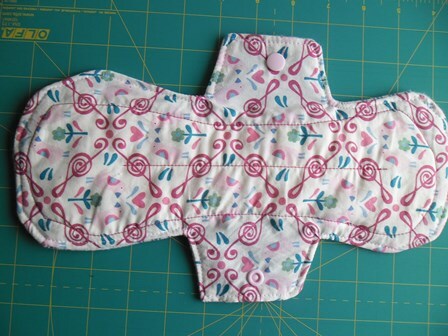 Amy has a great tutorial on how to make a pad with a PUL layer. It is extremely hard to tell the absorbency level of a pad just by looking at it. Even sewing the cores I had to distinguish the heavy pads with a pin because once they are sandwiched together and stitched the look the same. 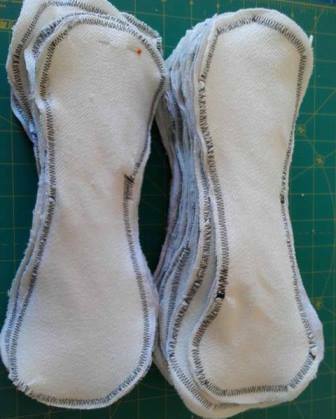 I read many ways people tell their pads apart. Some use different fabrics, some use different coloured snaps. My first thought was to use the lettering on my machine and do H for heavy. I did it on the pads but it didn’t look like it would last so I thought I’ll just do different coloured top stitching when I got to the top stitching stage. For my backing fabric I used flannelette. By chance when I was putting the backing fabric on my first heavy I placed the fabric upside down. This was my instant solution to identifying between regular and heavy. It was a clear obvious distinction. When I’m half asleep and getting ready for work I don’t have to put much thought as to what I’m grabbing I just know if I want heavy it needs to be plain. I don’t need to look for coloured snaps or top stitching or a particular fabric which are some of the ways people use to tell them apart. I used white thread for all the top stitching on the pads. Most of the fabrics had white somewhere in the design, if they didn’t the white still went well with them such in the yellow one. 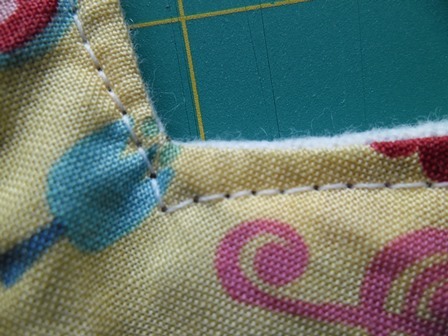 The top stitching is right near the edge of the fabric and disappears in so you don’t really see it. I used light pink snaps on every pad. I have heaps of that colour so it used them up. The pink snaps again go with most of the fabrics. I even squeezed in some hexie printed fabric. The pattern I used was the Luna Wolf 11.75″ It is a free pattern. I liked the shape of this pattern as it very much symmetrical. 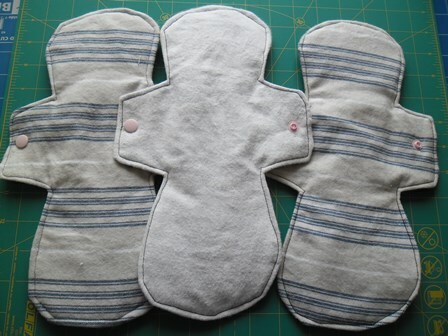 Google cloth pad patterns and you find different shapes and sizes as everyone has different preferences. 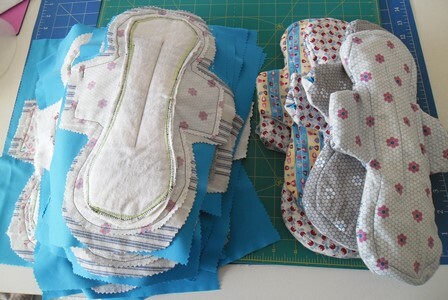 I made 20 pads. I used 10 fat quarters as I got 2 toppers per piece. I used nearly 1m of the French Terry (I have small bit left over) for the cores. The PUL I used I think about 1.7m admittedly I wasted a lot of the PUL as I cut it in a rectangle shape, once the pad was the pad was constructed I cut away the excess. It was a little slippery and because I was making so many I didn’t have the time or patience to cut the exact shape from the start. I still need to make my overnight pads. I want them to be longer. I had to buy more supplies which I have done. I still have to do one more pre-wash of the French Terry (you do several pre-washes to shrink it and increase the absorbency) I still haven’t decided on a pattern yet. Luna has a tutorial on how to lengthen the pad pattern I used so I may go with that idea. Also I need to work out a way to store them. Sadly currently they live in a pillow slip under my bathroom sink. After I get my Christmas gifts done I may do a fabric basket or something along those lines. For now I’m not bothered I have pads I can use, they are comfortable and they work.